Having just moved house, it means I've also moved around 100 large boxes of books, CDs and records. A month in, and I'm still only some way through the unpacking. This is deliberate accumulation, years rummaging the second hand and charity shops as well as buying new stuff. I seem to have replaced the reading of books with the buying of them. That's perhaps a topic for another day. Clearly, building a personal library is different than just buying things to read, and the plethora of literary biographies and lit crit books testifies to that aim. But the library only works of course if you can find the books that you have got. With the internet still being quite stubborn about what is available online, it makes this resource both a valuable one and a frustrating one. There's also something about the context of a book - its font, its cover, its binding - which the virtual can never replicate. More people than ever want to be writers, it seems in an age of instant gratification, the far from instant gratification of writing a novel is high on a lot of people's To Do lists. Perhaps this is the inevitable corollary to an educated workforce, many of whom are in dispiriting or uninspiring jobs. Despite all top employers asking for and valuing creativity, you'll find it near impossible to get a creative job without a hell of a lot of luck, graft and probably privilege. 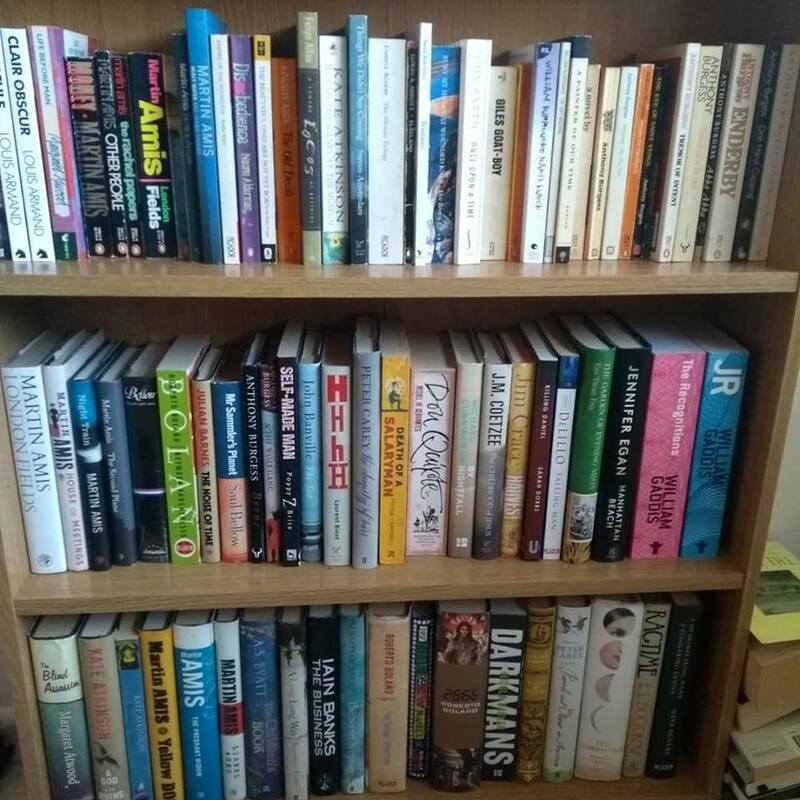 Yet look at the thousands upon thousands of new flats popping up around Manchester and other cities, and they are hardly endowed with any storage, let alone room for bookshelves. Large glass windows, and integrated kitchen-living spaces reduce the amount of wall space available. We are a society driven by consumption, but have failed to create a space where we can enjoy what we can consume. No wonder the high street is dying to be replaced by "experiences", Years ago a girl at sixth form said she'd much rather spend her little money on a night out than a record, and at the time I disagreed with her - but over the years I guess I became far more outgoing. Yet the endless nights out morph into single memories, just as a pile of records becomes anonymous when hidden in a record case. Without the charity shop I'm not sure where all these books would go - but even these seem to be reducing the space given over to books, CDs and DVDs. I reluctantly binned a load of VHS videos, thinking nowhere would take them. The one charity shop I know that has some still has them at 5 for £1. DVDs are going the same way - yet our reliance on paid for and subscription services is a risky one. Just as copyright restrictions meant it was often years before much loved BBC and ITV dramas and comedies made it onto a physical media, so it is nowadays, that the dog-eat-dog world of streaming services can see whole film catalogues disappear, even though absolutely everything appears to be on YouTube in one form or another. CDs are the same - the record industry having killed vinyl, only to see it become a revenue life saver, is rapidly killing CDs even though it remains their biggest selling format. One of the things that's happened is that the living room has been handed over to the tech giants who are far more interested in selling you the air that you breathe (or wifi that you watch) and the forever obsolete devices that act as filters than in offering you personal control over your living space. In the tiny city centre flat, where is the value in finding room for DVDs and the like? Books do furnish a room however, and I'm spending the weekend building more bookcases. There still seems to be something noble and valuable in having, say, all Ian McEwan's novels together. But not just that - over the years I've picked up a few gems. I didn't realise I'd got half a dozen books by Jean Rhys for example, though I perhaps don't need three (so far) copies of "Wide Sargasso Sea", or a library of William Golding in their lovely 60s Faber covers, or those Nabokov reissues from the seventies with a uniform font and design. Putting all my poetry books in one place surprises me with the scope - though notably thin on the Picador-Cape-Faber establishment of the last twenty years, which tells its own story - whilst amongst my "most valuable" books (according to Abebooks at least) are several music related titles, as they rarely get reissued. The idea of value is one that intrigues me. In a time when our experience of a Cafe Nero or Costa is worth £3 for an hour of contemplation and wifi, usually in a place that is too packed, and untidy, what price a novel? I'd struggle to sell most of mine for more than a penny (plus post and packing) online. 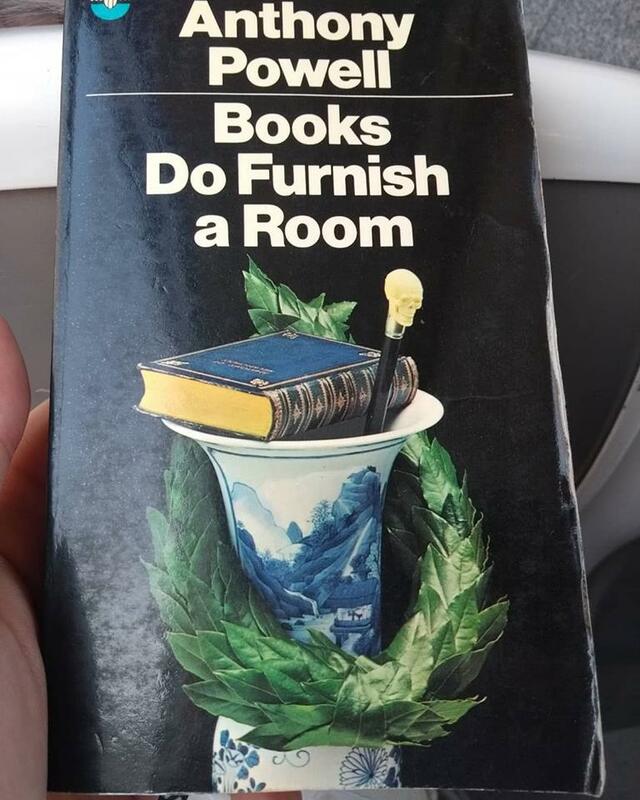 Charity shops range from 75p to £3 for often the same book. Though I sometimes complain about Oxfam's prices (on records particularly), I can't criticise them for trying to value the books they sell more than the price of a hot beverage. 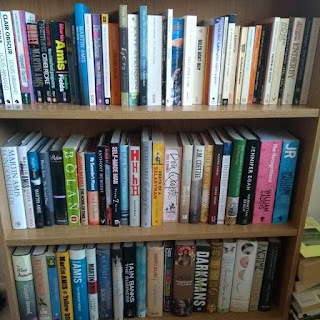 I undertook an experiment a couple of years ago where I collected books I really loved and bought extra copies from charity shops when I saw them in near mint condition. I then sold them at a book fair for £4 each or 3 for a tenner, with a little bit of a back story. I did surprisingly well. Certain books will always fly off the shelves, the audience, unlike the audience for say, the first 2 Adele albums, is never sated. Recent bestsellers have included "The Handmaid's Tale", "The Great Gatsby" and "To Kill a Mockingbird" though all have been easily available secondhand for years. The writers whose time has gone, I suspect are some of the big American boys (mostly boys) who dominate my shelves. The sheer prolificness of Roth, Bellow, Updike, Vidal and Mailer, as well as them being bestsellers in a time when books were read in numbers, means that they are as common as the Eagles' Greatest Hits. Rarity is the only thing that really appoints value, yet books are mass produced objects, so outside of small press poetry publications, and genuine first edition hardbacks, is there much that has value? The words should be enough of course, and its fascinating to note the amount of different covers that classics have had over the years, each reprint giving a book marketing department a chance for subtle changes or total overhauls. Beyond the big names, I'm struck by the number of books that already seem forgotten ready for pulping. 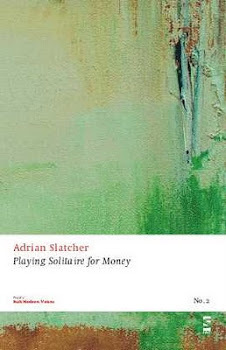 You can wonder why a book like "Stoner" could be resurrected as a 21st century hit, but then when you see the sheer number of novels, good, bad and indifferent that have never won prizes or been otherwise recognised, its quite humbling as a writer who would still like to add one to the pile.